I can confidently say that not only is Mary Poppins one of my favorite Disney films, but also one of my favorite movies, period. The whimsical atmosphere, impressive blend of live and animated action, coupled with an eternally memorable score supplemented by the amazing charm and talent of Julie Andrews and others… it’s practically perfect in every way. How could anyone hate Mary Poppins? That is, anyone except for the author of the original novels on which the film was adapted from, P.L. Travers. In Saving Mr. Banks, Disney attempts to portray on-screen the struggle between Walt and Travers for the rights to the latter’s works, while Travers also has to come to terms with her personal demons. Does Disney sugarcoat the reality of the situation with various liberties…? Well, yes. But despite doing so, the results are impressive all the same. Emma Thompson plays author P.L. Travers, who, due to her refusal to continue writing after the success of Mary Poppins (the book), is in need of money. Despite her financial deficiencies, she has refused to sell the rights to her stories to one Mr. Walt Disney (Tom Hanks), who has spent the last two decades attempting to adapt said stories into a feature film, as promised to his daughters. After wearing the indignant Travers down, Walt has her flown to California in an attempt to finally win her over and warm her to the project. All the while, Travers reflects on her own childhood—specifically her father (Colin Farrell), who inspired her to write Mary Poppins, and also molded her into the cold woman she has become. Initially, as I was watching Banks, I found my interest waning during certain segments of the picture; those segments being the flashback sequences showing Travers’ childhood. These scenes proved to be pretty schmaltzy affairs that, while ultimately necessary as the film progressively becomes darker, fail to really stimulate you outside of some foreboding foreshadowing. This is not to say they’re bad, especially with an impressively diverse performance from Farrell, but they did little for me in the first act. On the other hand, the tale of Travers versus Disney definitely stood out as strong. Again, to note the performances, this is in large part due to Thompson and Hanks. While the latter does well showing both the shrewdness of the businessman and the warmth of the father, the standout is Thompson. She brilliantly brings a natural maternal spirit to a by all means unlikable character, warming the audience to her by making her relatable. The liberties taken with the true events on which the film is based on are wholly understandable, and done in good taste. That is, nothing is drastically altered, save for some story modifications for the sake of a satisfying ending (an example being Travers relationship with her chauffeur, played by Paul Giamatti). While a spoonful of sugar is added to the story for the sake of audience good-feels, the film leaves off ambiguously enough to satisfy those who want their happy ending (without betraying the previously established foundation), and those who want to fill in the blanks with a dose of reality. 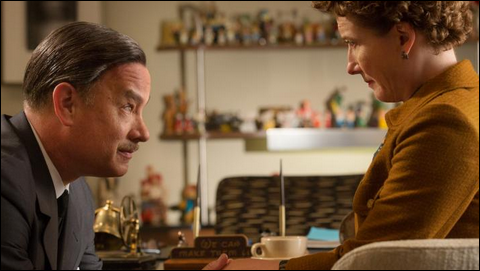 Saving Mr. Banks may reek as a self-congratulating affair for the House of Mouse, but really, if it is... who cares? The story is well told and enough heart is endowed to genuinely touch your own.